Love your neighbor as yourself (in all areas). We don't simply want food and clothing for ourselves. We also want relationship, purpose, discipleship and community. Loving our neighbors as ourselves means wanting this for them, too. I Corinthians 13 is not just about marriage, but applies to all communities of faith. Giving sacrificially of time, energy and financial resources without expectation of 'return' or 'result' because we understand that all of our resources are actually His. We believe there are no levels of spirituality, only layers of surrender. We believe every person is made in the Image of God and has unique purposes to fulfill as they go in all areas/spheres of life (release vs. retain). Standing shoulder to shoulder with the oppressed. We believe that the Lord works in ways that subvert traditional thought and culture and that He often gives honor to the places and people the world dishonors. At all times, we will seek to give honor and deference to the communities which we engage and act as neighbors and friends, never providers or superiors. In resourcing under­-resourced communities, we think critically, strategically, research­ based; then we act responsively to the Spirit. Doing all of this only because we have found Jesus to be such a treasure that we find freedom to join Him in His redemptive work in the margins of society. We are Christ-­driven, not cause-­driven. We care more about pursuit of Jesus than we do activism. Religion in ANY form is a barrier to knowing the grace and truth of Jesus and we seek to lovingly dismantle the hold it has on each of us and those in our city. The Spero Project Began in 2009 as a blog to help small group leaders find creative and challenging ways to engage those in their groups to care for their local and global communities. The Spero Project quickly evolved into an organization with a life of its own. computer screen and function on a daily basis with under-resourced communities. 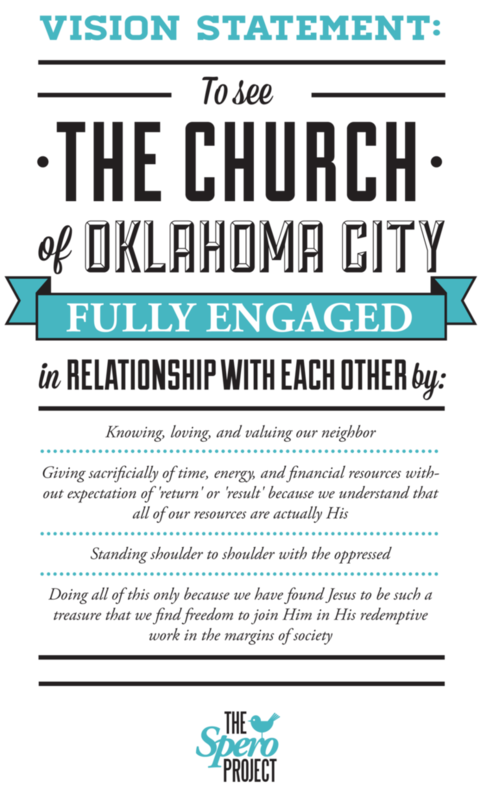 Upon becoming a 501(c)(3) Registered Nonprofit in June of 2009, we have broadened our scope and created a variety of innovative projects that address specific needs in Oklahoma City. These projects include RALLY, FULL, THE COMMON, MARKED and SHARP. Their commonality is that they mobilize the church into the margins of our city. to be able to look ahead and have the humility to learn from those further along that can help us push our city forward. We know that the Lord is at work in our city, we see Him waking the church and bringing the pains of our city to the front steps. We see a city full of people that love Jesus and have a desire to radically serve.